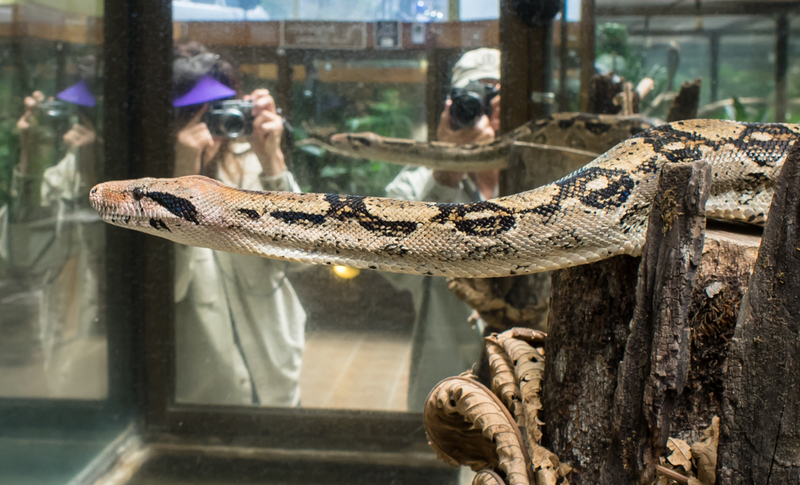 We concluded our stay in Monteverde with a visit to the Herpetarium snake musuem per Kathleen's request. Snakes have always given me the hebe-jeebees so they have never been on my "A" list. But, when in Rome, act like a Roman. So we got tickets and checked it out. 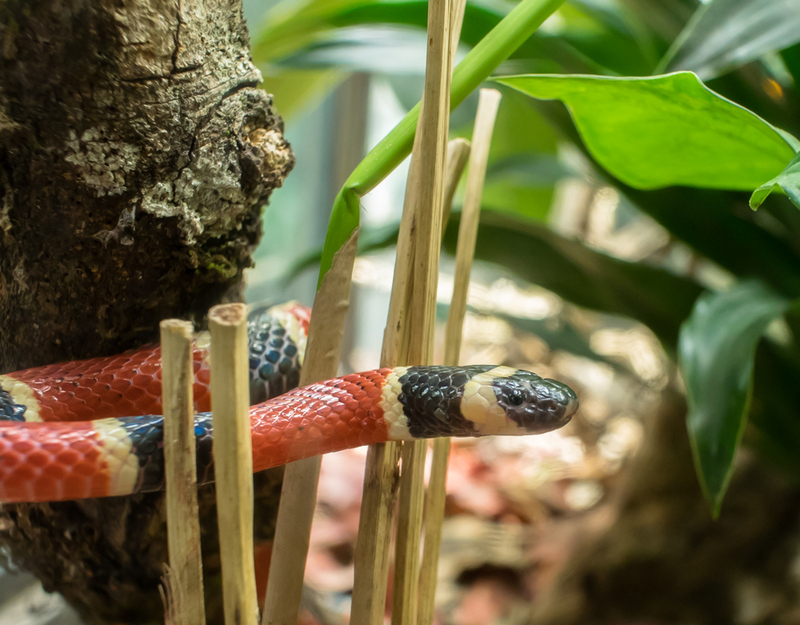 This is a Coral Snake and they are common in this area. In addition to being beautiful, they are also venomous. 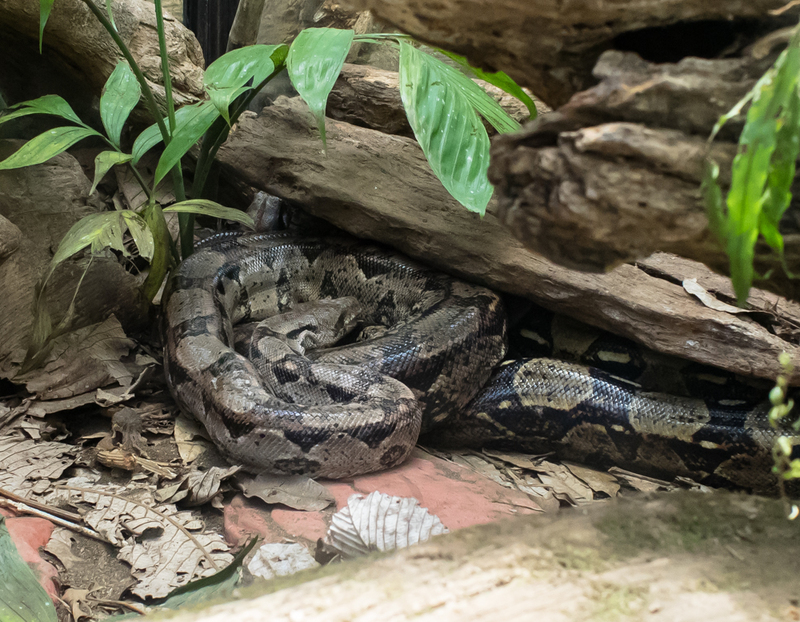 This is a large Boa Constrictor and is a native species here in Costa Rica. 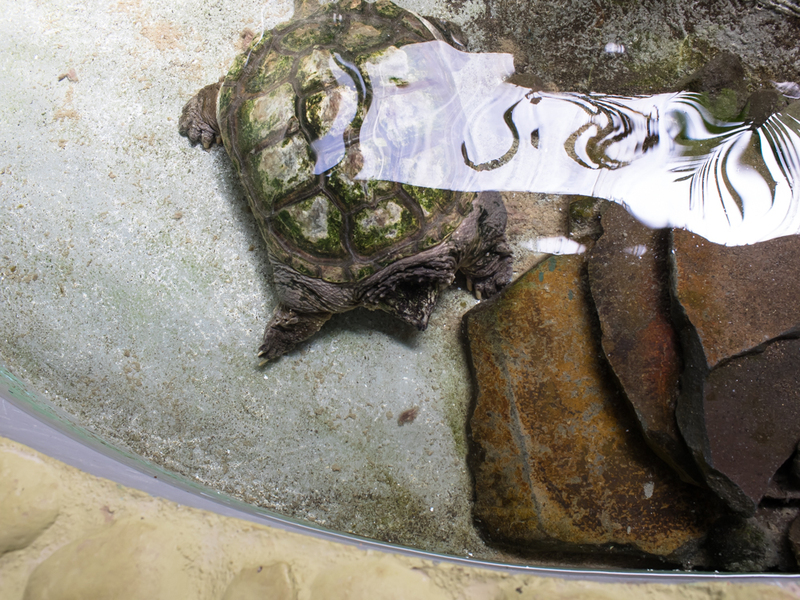 This turtle was quite large; about 2 feet long. 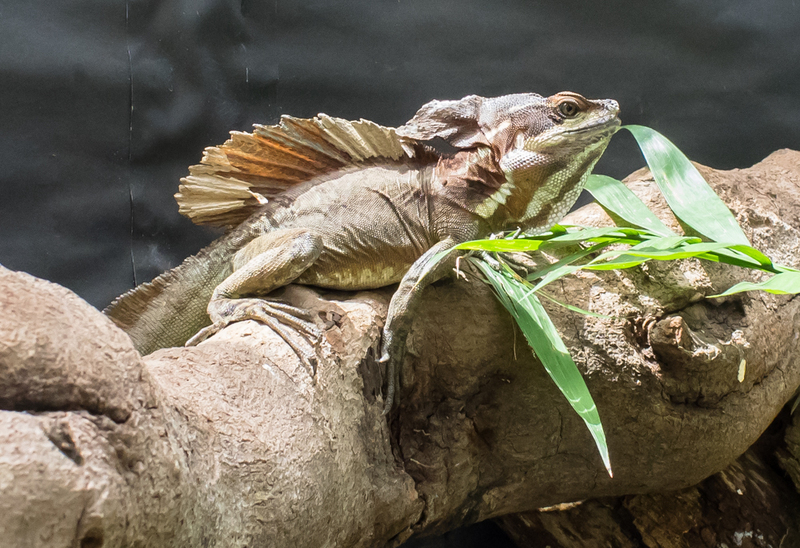 Other than this museum, we have seen no lizards or frogs on our brief forays into the jungle. 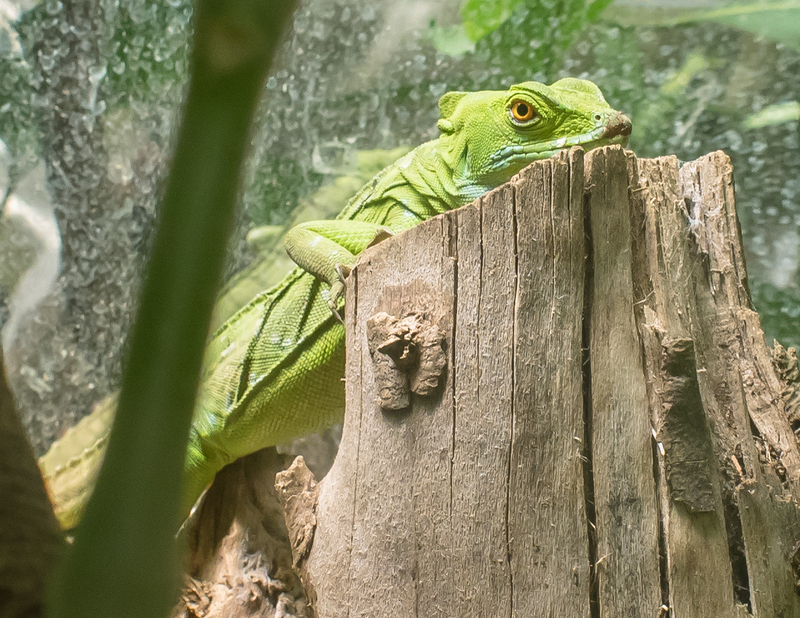 This lizard is a nice bright green which helps him blend in with the jungle foliage. 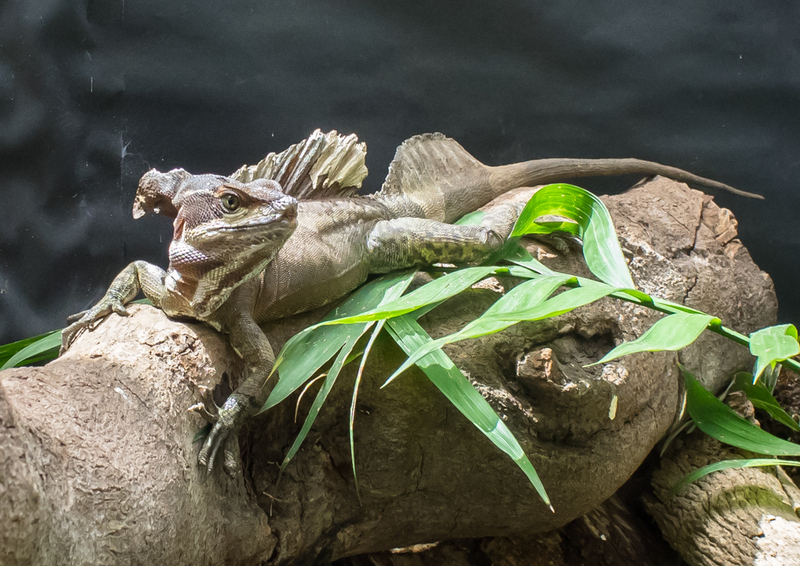 I did not note the name of this species, but his body is right out of Jurassic Park. He saw us approach and watched us closely. He decided that we made him nervous and changed positions for a better view of us. Now you can see the huge dorsal fin and the long toes. Another constrictor of some kind. 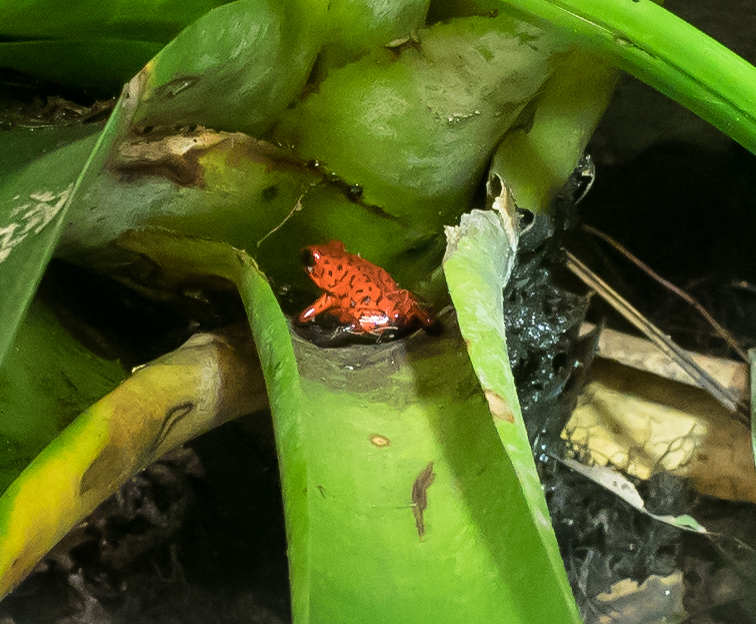 This is a poison dart tree frog hiding in the leaves of a bromiliad. This guy is toxic and perhaps 30mm long. The natives use the secretions from the skin to coat darts for their blow guns. 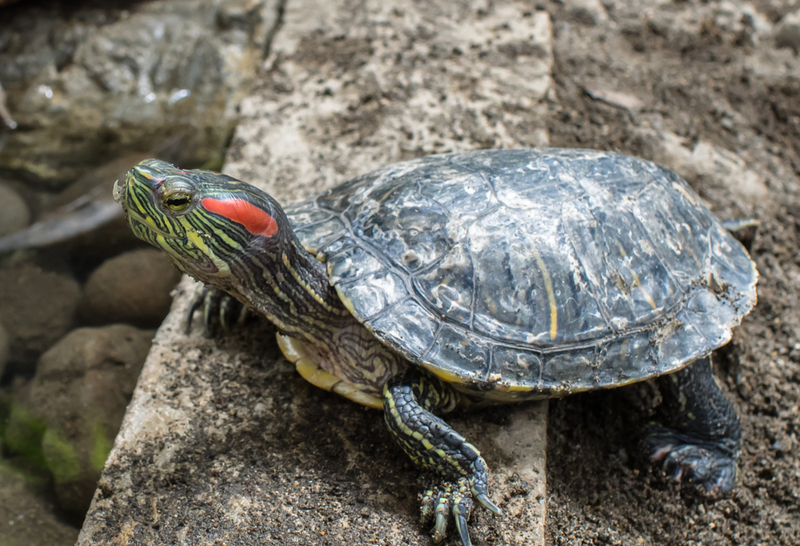 This turtle was not afraid of us, but rather extended his neck as we came close. 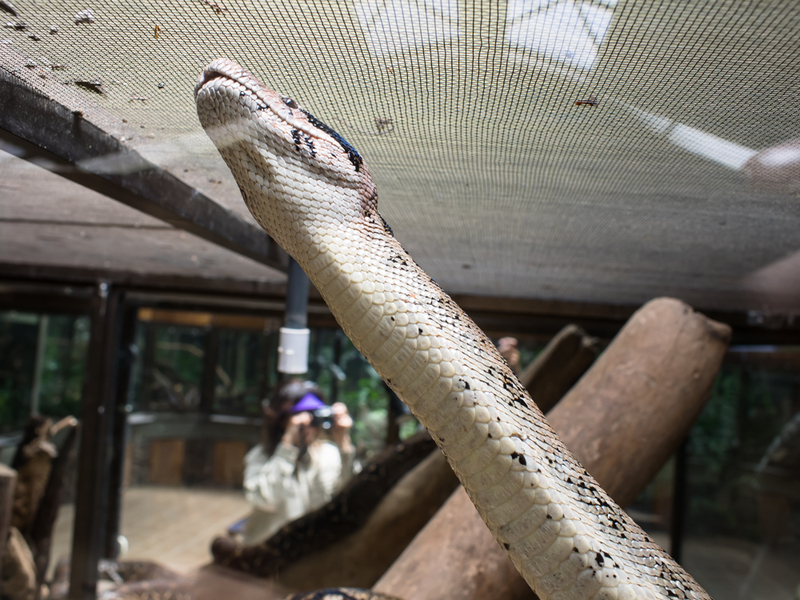 While we were behind glass and a bit big to serve as a meal for this snake, it gave me the chills watching him move around the enclosure. 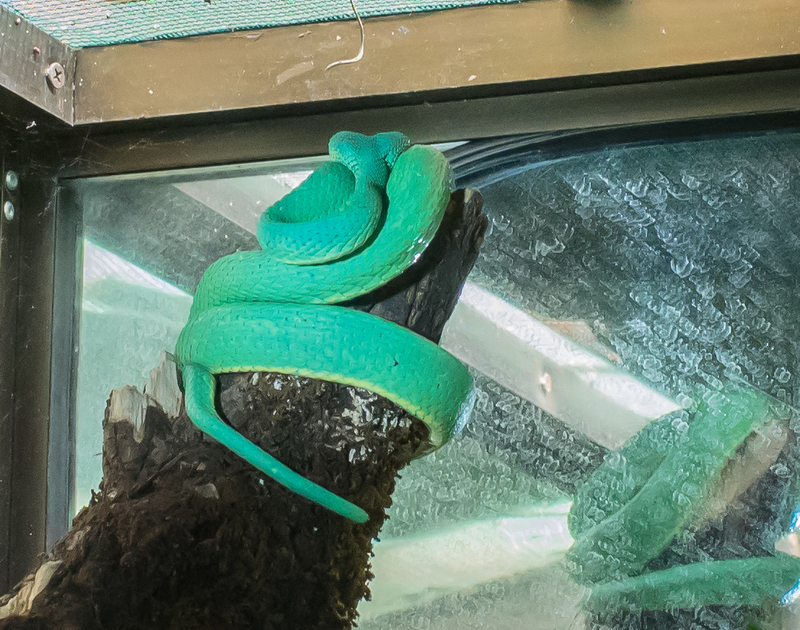 This snake is the real deal: arboreal, small, brightly colored and highly toxic. 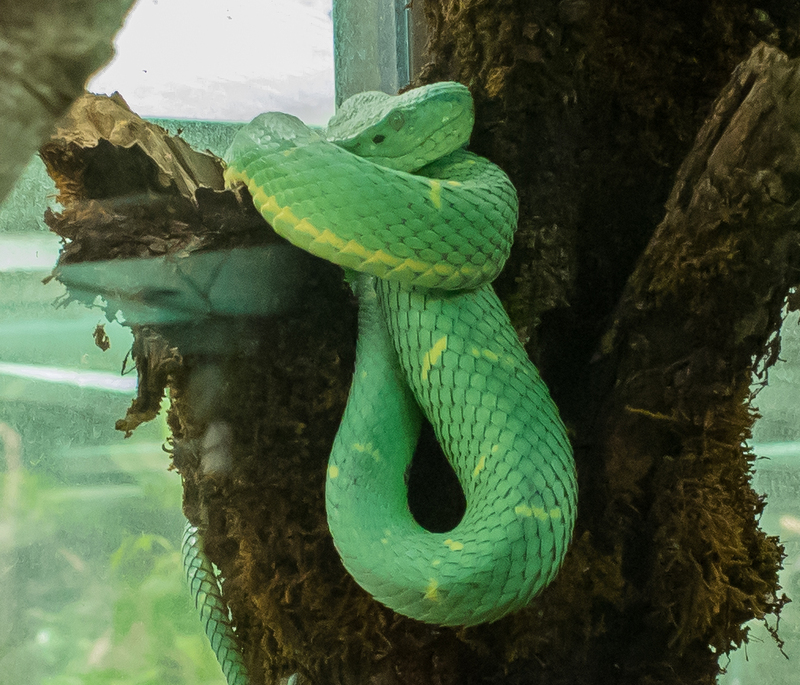 This is a pit viper called an Eyelash Palm Pitviper. Note the huge bulges behind the eyes -- these are venom sacs. Even the eyes are camouflaged. His buddy further up the tree had even larger sacs. This is another type of Eylash Viper. 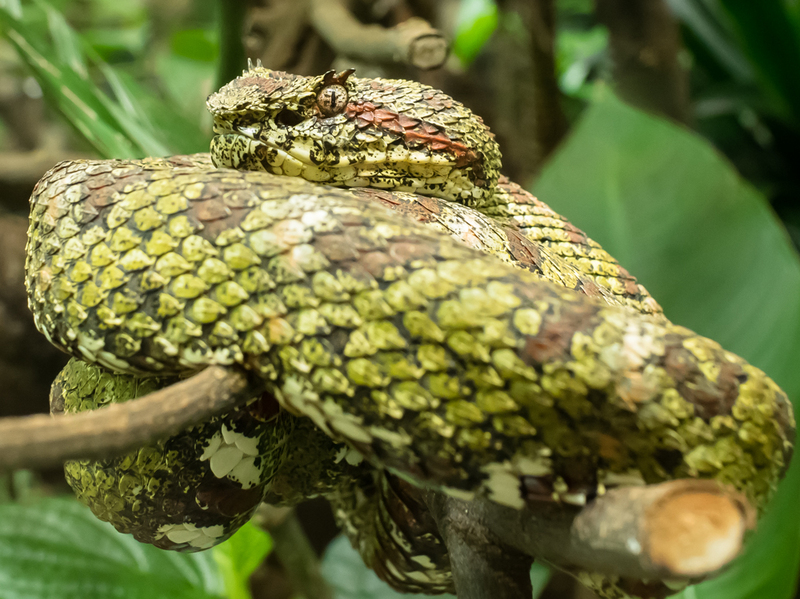 His eyelashes are clearly visible and are thought to break up the outline of the snake's head improving camouflage and stealth. Prior to leaving the hotel, we asked some questions about the local roads. The road in from Tilaran was pushishing, so we were anxious to find another route that was less rough. 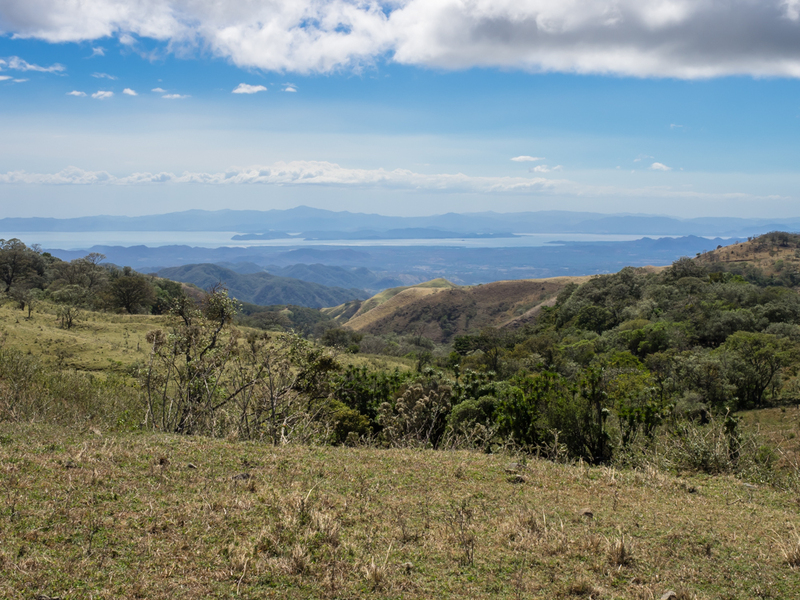 The hotel told us that all roads to/from Monteverde were dirt but the road to Tilaran was the longest. He suggested that going to Las Juntas would be a shorter road but rougher and therefore "more pain but for less time". Interesting logic, but it worked for us. After lunch we headed off to Las Juntas. The roads here are made of crushed stone of a variety of sizes ranging from basketballs to golf balls. The spaces between the stones were filled in with pea gravel and sand. But as a result of use and the rains, the sand, pea gravel and smaller stones are expelled leaving baseballs and bigger as the actual travel surface. Any areas that consisted of smaller stones were converted into pot holes. The resulting surface was as nasty as any developed road I have seen in the U.S. or Baja (and that is saying a lot). We traveled at 5-10 kph and it seemed too fast. 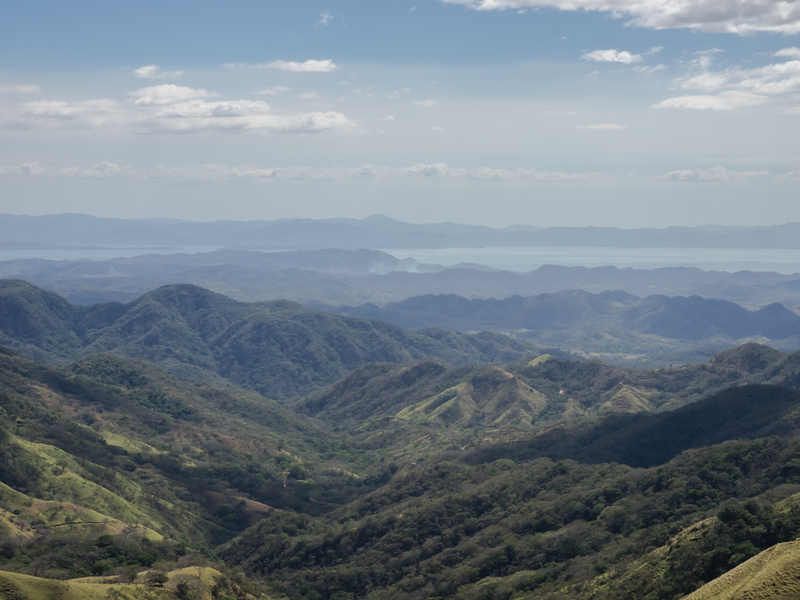 After an hour of pounding, the road crested a ridge that gave us a nice view of the Golfo de Nicoya. Visible to the south is another fire, likely a cane field being burned in anticipation of planting. The steep terrain combined with the soil type and rain has resulted in slumping on the surfaces of the hills. Note the ripples on the hillsides that have been cleared of brush for cattle. 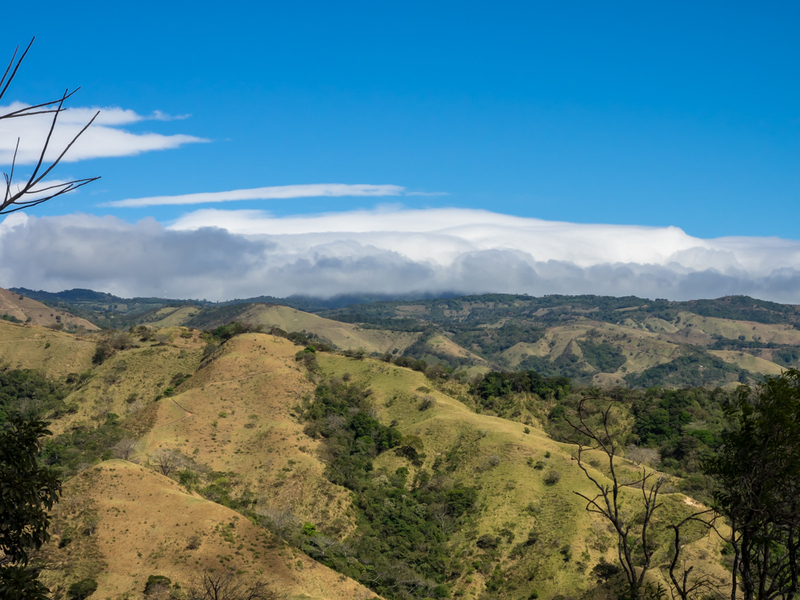 Looking to the east back toward Monteverde, the cloud bank that occupies the ridge is still in place. The winds were howling along the ridge where we were making standing still for a photo very difficult. 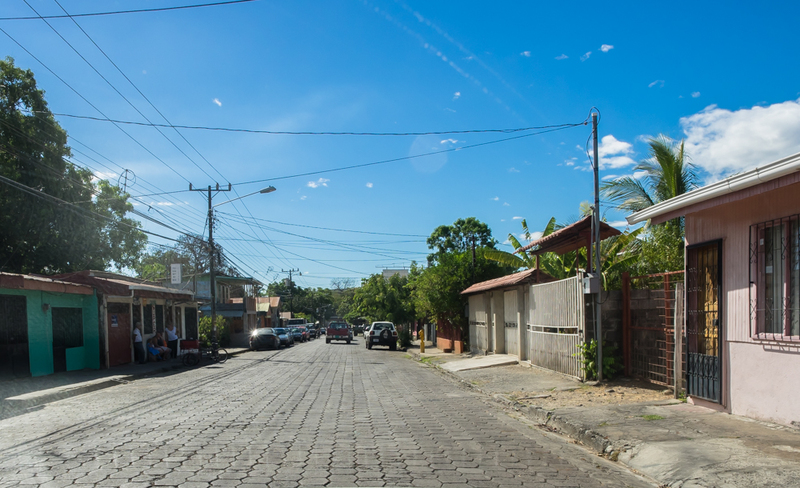 We arrived at Las Juntas and found streets paved with hexagonal bricks. 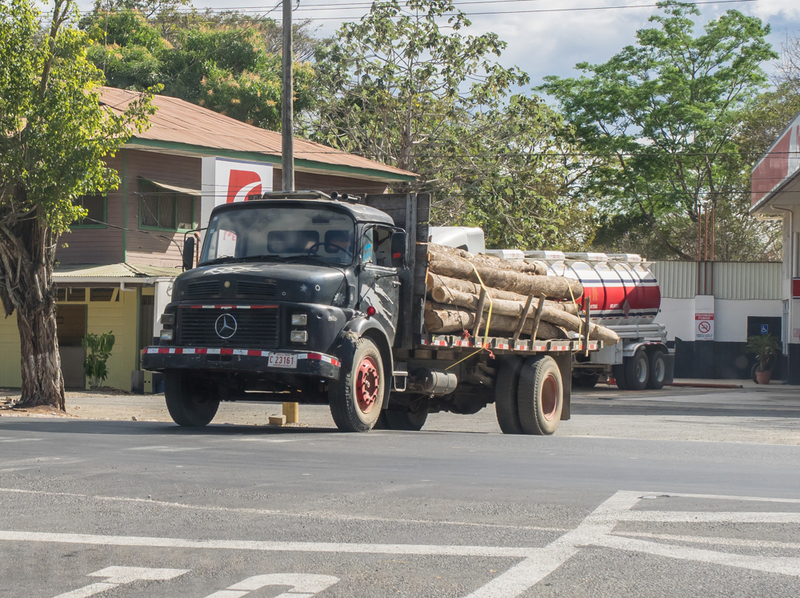 We continued on to the main highway and spotted this older Mercedes truck still working for a living hauling lumber out of the jungle. We continued north on the main highway toward Liberia and passed a field that was burning. 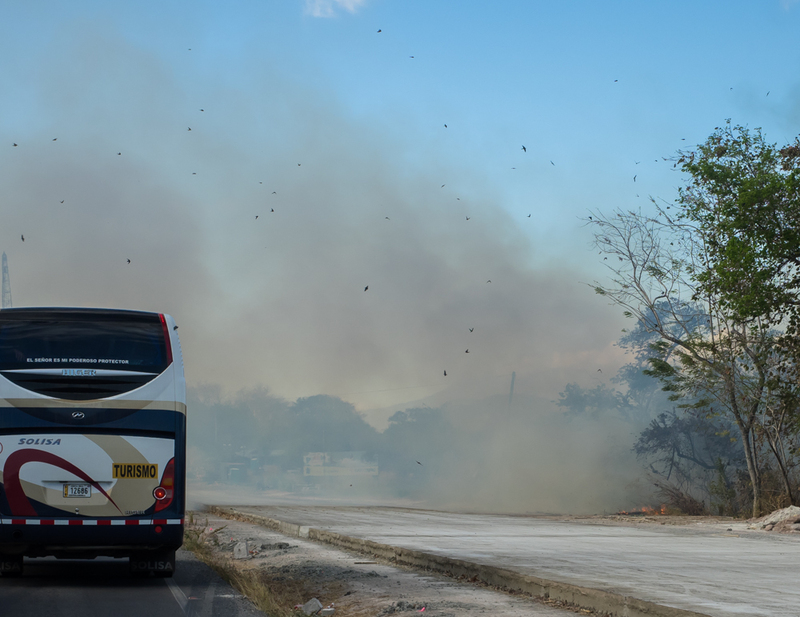 The fire was causing the bugs to flee resulting in a huge flock of birds being attracted for a feeding frenzy. The birds were happy; the bugs less so. We found a hotel right on the beach that was reasonably priced (around $100). 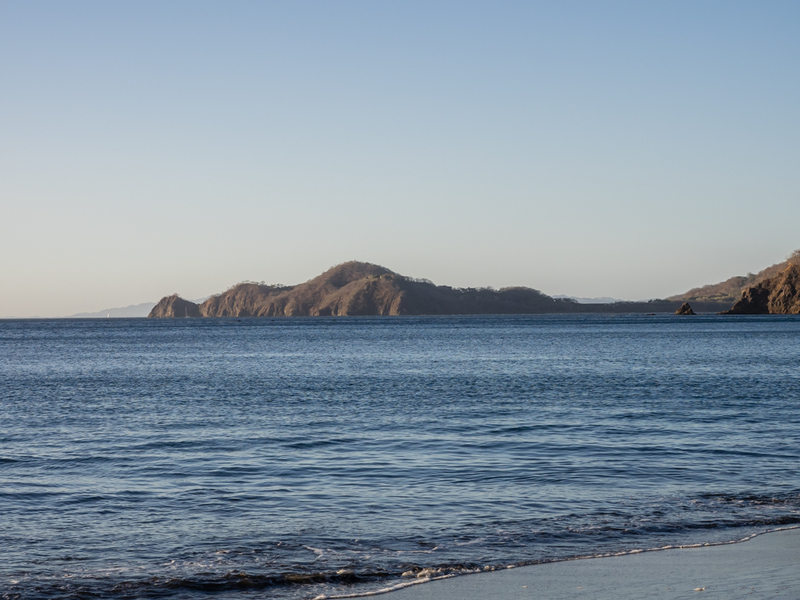 The high-dollar Gringo resorts (Hilton, Four Seasons) were anywhere from $800-$4000/night, so this was a steal. The Hilton was a steal as well, but it is the tourist that is being robbed. 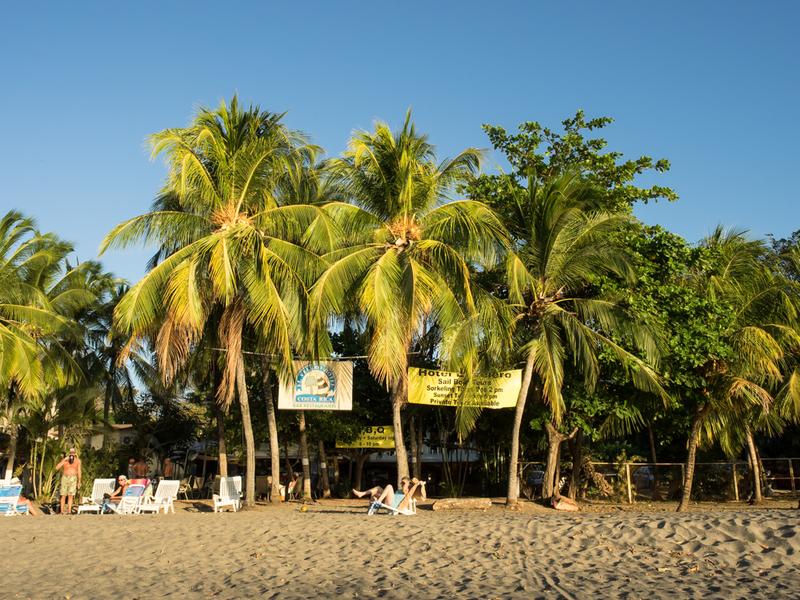 The place was clean and nicely kept, had everything we needed: restaurant, bar, pool beach. We went down to check out the beach and could see the rocky headlands to the north. 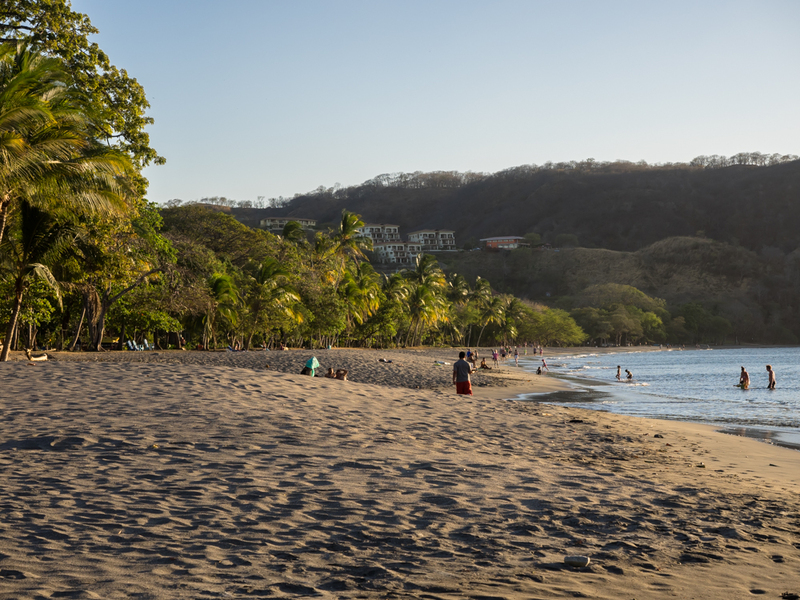 The beach sand is a mixture of shells and volcanic debris so it is gray rather than the "normal" sand color. To the south were some condos up on the hillside. 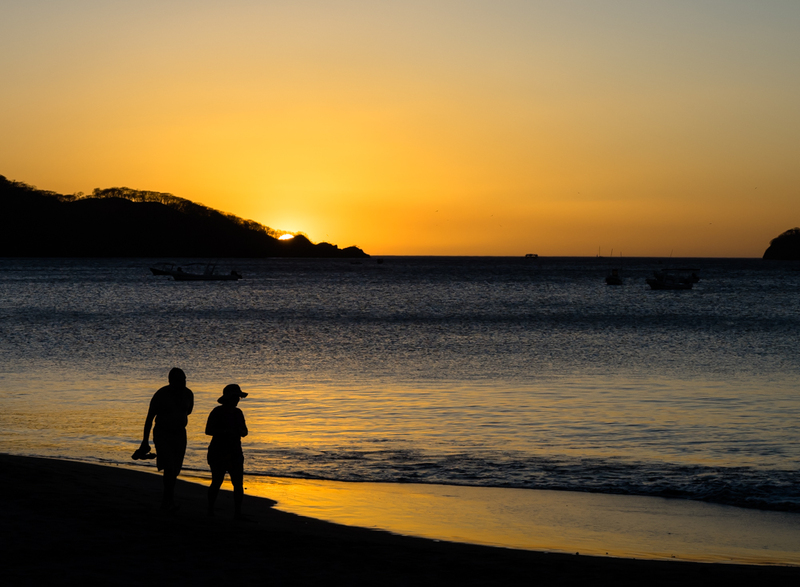 Sunset arrived and there were a group of folks walking along the beach or just watching with drink-in-hand. 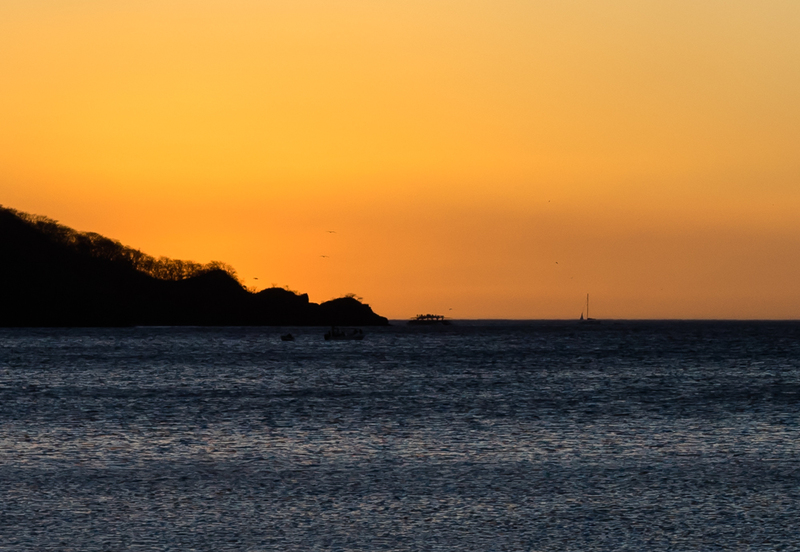 As the sun set further, the colors deepened and allowed us to see sea birds on the hunt over the far cliffs. Seeing the snake museum was interesting but still creepy. There were huge vipers there that we not visible to the camera including Bushmasters, Fer-de-Lance, Piedra de Mano and "standard" rattlesnakes. Each was highly venomous and very deadly. 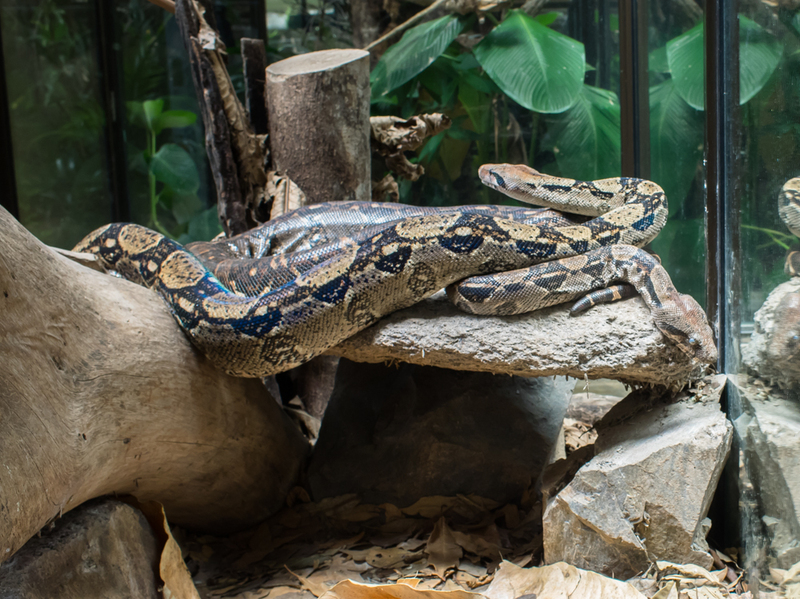 The Bushmaster was as large as the Boas, but have fangs and can strike many feet. Ugh. 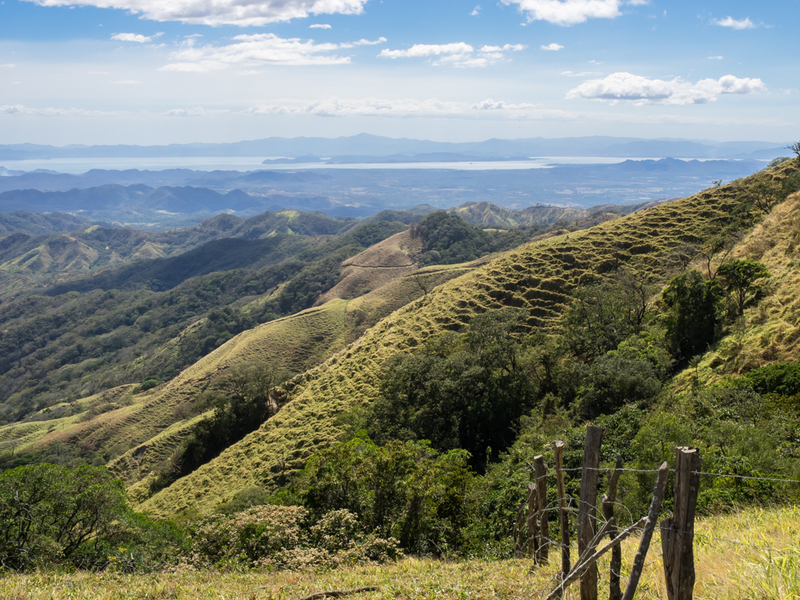 The road from Monteverde was hard, no doubt about it, but also unavoidable. Monteverde was interesting and worth a visit, but I would not return as there are other places to see the jungle without suffering the dense crowds and uncomfortable roads. Next, a down-day at the beach.